Prior to the Revolution my Hubbard and Holt ancestors moved from Massachusetts to Vermont (which was not one of the original 13 colonies). Vermont did not come into existence until after the Revolution. Prior to the Revolution, Vermont was part of New York State. About 1724, the Govenor of New Hampshire began granting land to people who settled near what is now Brattleboro in Vermont. 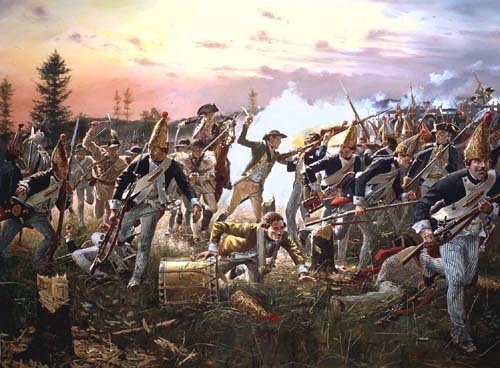 After the fall of Montreal in 1760 (during the French and Indian Wars), settlers began swarming into Vermont and settling along the Connecticut River and the road that led from Charleston, N.H. to Crown Point, N.Y. (near Fort Ticonderoga on Lake Champlain). The Govenor of New York became upset that the Govenor of New Hampshire was making land grants in what he considered to be New York. He wrote to the King of England and complained. The King sided with the Govenor of New York, who then decided that all the settlers would have to apply to him for their land grants. This did not set well with the pioneers. Ethan Allen formed the "Green Mountain Boys" to give a birching (whipping) to any "Yorkers" who tried to take land away from the pioneers who were already settled in what would become Vermont. The Govenor of New York considered the Green Mountain Boys to be outlaws. When the Revolution broke out, the people who lived in this area of New York held a convention and declared themselves an independent entity called Vermont. By the 1770's the 13 American colonies were becoming increasingly independent when King George III made the mistake of trying to impose import taxes on British goods into the colonies. This led to the famous "Boston Tea Party" that took place in Boston Harbor, where American patriots dressed up as Indians and threw British tea into the harbor. As soon as the first shots were fired on Lexington Green on April 19, 1775, my ancestors began to play their parts in the fight for liberty. When the Vermonters heard that a group of Hessian soldiers were on their way to pillage Bennington, they instantly raised an army of Minutemen under General John Stark. My ancestor, Elisha Copeland Hubbard was a Corporal in Lieutenant Moses Johnson's Company in Colonel William William's Regiment. The American patriots thoroughly thrashed the 1,000 Hessians with only a handful managing to stumble back to Burgoyne empty-handed. Elisha and Thousands of Minute Men converged on Burgoyne's badly demoralized army at a place called Saratoga, NY. After two days of fighting, Burgoyne surrendered on October 17, 1777. Burgoyne and his army were taken to Boston where they were paroled. Elisha's company was mustered out of service immediately after the Battle of Saratoga. His rate of pay was £ 1.8 per day and the men who had to pay the bills probably didn't want to keep men on the pay rolls if there wasn't an immediate threat. But two months later, on November 26, 1777, Elisha enlisted for three years in the Vermont Milita. He served in Captain Wood's Company of Baldwin's Regimental Artificers. He was discharged again on January 17, 1778, probably to save money, as there was no military threat in the Vermont area at that time. Another of my ancestors also participated in the Revolution. Samuel Shannon was born in New Hampshire sometime before 1750. He initially enlisted as a private and served for ten months in Captain Daniel Reynold's Company in Colonel Stephen Peabody's Regiment from February 12th, 1778 to January 4, 1779. This regiment served in Massachusetts and Rhode Island during part of this time. His rate of pay was £4.10 per month. His brother John served with him. After the Revolution, Samuel moved to Vermont.. There were a number of Shannon's (including a different Samuel Shannon) living near Exeter and Rye, in Rockingham County, New Hampshire (about 30 miles North of Boston) during this time. These Shannons were probably ancestors and close relatives. I believe Samuel Shannon may have been descended from a man named Cutts Shannon, who fathered many Shannons in New Hampshire. Samuel Shannon became a Shaker (a religious sect) in later life. Shakers lived celibate lives and died out. Thankfully, Samuel waited until after he fathered John Shannon to become a Shaker. Otherwise, none of us would be around to read this. We don't know the name of John's mother. On January 6, 1792, Samuel married a second wife, named, Lydia Griffin in Chester, Rockingham County, New Hampshire. Captain Abijah Moore as serving in Massachusetts during the Revolution according to Soldiers, Sailors, and Patriots of the Revolutionary War - Vermont by Major General Carleton Edward Fisher and Sue Gray Fisher, published by Picton Press, Camden, Maine. Either before or after the war, Abijah moved from Sudsbury, Massachusetts to Putney, Vermont. Family records indicate Benjamin Holt lived near Bennington, Vermont and also fought in the Revolution.